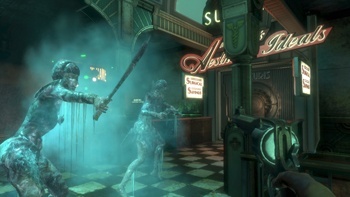 Curious about BioShock 2 but haven't played the first yet? Now, you have no excuse: Pre-ordering the new game on Steam means you get the first game absolutely free. There are plenty of people who are looking forward to going back to Andrew Ryan's sunken metropolis of Rapture when BioShock 2 comes out on February 9th. But before you can go back to Rapture, you have to go there first - and it doesn't hurt that the original BioShock is one of the most highly-acclaimed games in recent memory. It's just a damn good game, start to finish (well, maybe not the finish), with some excellent writing and atmosphere of the sort that just isn't found in many games these days. But in case you can't be bothered to shell out the $10 or so that it'll take to buy a copy of the 2007 RPG/FPS hybrid, how about this: Pre-ordering BioShock 2 via Steam gets you a 10% discount on the actual game (or $5, bringing the price down to $44.99) when it comes out in three weeks, but gets you a free copy of the original BioShock right now. And if you already have BioShock, you can gift it to your friends. Or you can buy four copies of BioShock 2 if you... really, really want to, and give them all to your friends or something - it's one of those deals that I doubt anyone will ever use, but Steam has it up anyway. It may not be a special "American Baseball Bat" (I still don't know if there's any other kind, given that cricket bats are called just that) or Bill's Veterans' Beret, but it's a free game, and it's a damn good free game. If you were planning on getting BioShock 2 anyway, what do you have to lose?